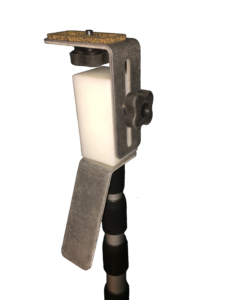 The patented (pending) Backstop Camera Mount makes it easy and fun to film yourself (or anyone else) playing baseball or softball! Adjustable camera bracket eliminates guesswork and the telescoping pole allows you to get all kinds of different angles, without having to bring a ladder! The mount works from outside the fence, so your camera will be protected from a direct hit off the bat. The low profile is so unobtrusive many players and fans don’t even know it’s there! Use your smartphone to video a game, or even just a few at bats! 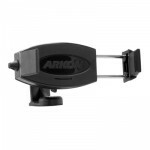 Newer smartphones have excellent video capabilities and the Arkon Mobile Grip Adapter for tripods and camera stands lets you use your smartphone camera with any tripod, and with the BCM-1 camera mount. The BCM-1 (Backstop Camera Mount) works fantastic with the GoPro! Super easy to use. Mount as with any camera, but the wide angle of the GoPro (similar to the MUVI K-series cameras) assures that you will never miss even the deepest hit balls. However, you’ll need this adapter to go between the mount and the GoPro, as GoPro does not provide for a screw mount attachment for any tripod. Now you can record your entire baseball or softball games without having to adjust the BCM-1 on the fence! 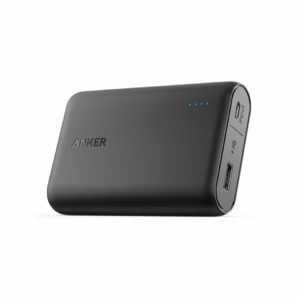 The Anker PowerCore comes with a handy travel case that allows you to hang it from the top of the BCM-1 mount. It has a USB dock so you can use your own power cord to charge your device. Note that the Go Pro cameras require a skeleton case to charge while filming, which is sold separately. Get your BCM-1 faster with USPS express shipping! It’s their fastest domestic service with overnight scheduled delivery by 10:30am. Note that the total shipping will be $47.00 for domestic shipments.